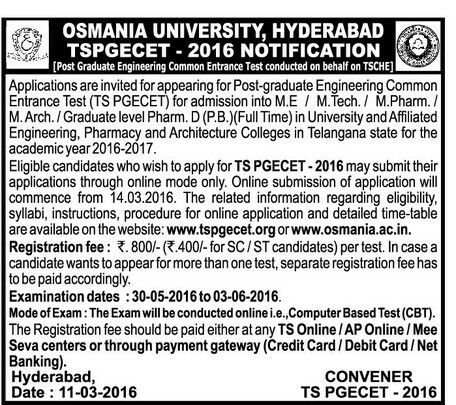 TS PGECET 2016 Online Application Form TSPGECET Notification :Applications are invited for appearing Post-graduate Engineering Common Entrance Test (PGECET 2016) for admission into M.E / M.Tech. / M.Pharm. / M. Arch. / Graduate level Pharm. D (P.B.) (Full Time) in University and Affiliated Engineering / Pharmacy Colleges in Telangana state for the academic year 2016-2017. Eligible candidates who wish to apply for PGECET 2016 may submit their applications through online mode only. The related information regarding eligibility, syllabi, instructions and procedure for online application are available on the website: www.tspgecet.org. or www.osmania.ac.in. Registration fee: .800/- ( .400/- for SC / ST candidates). In case a student wants to appear for more than one test, separate registration fee has to be paid for each test. Examination dates: 30-05-2016 to 03-06-2016, detailed time table is available on the website. The Registration fee may be paid at any AP/TS online center or through payment gateway (credit / debit card). The vacant seats after admitting GATE/GPAT qualified candidates will be filled with the candidates based on the Rank/percentile score secured in the PGECET 2016 Entrance Test. Separate notification will be issued for registration of GATE/GPAT Qualified candidates. Candidates are required to apply for TSPGECET 2016 test through Online only (printed hardcopy of the applications will not be accepted). The application/ registration fee for the test is Rs. 800/- (Rs 400/- in case of SC/ST). In case a candidate wants to appear for more than one test, separate registration fee has to be paid for each test. TSPGECET 2016 will be held at two different regional centers in the state i.e., Hyderabad and Warangal. As per AICTE the eligibility criterion for admission to Engineering and Pharmacy is 50% in the qualifying examination (45% for reserved category). Further, the qualifying degree (Professional courses) obtained under distance mode must have AICTE/DEC approval. The Hall-Tickets are to be downloaded from the website www.tspgecet.org. Without Hall-Tickets the candidate will not be allowed into the test centre.